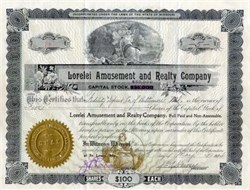 Beautifully engraved certificate from the Lorelei Amusement and Realty Company issued in 1914. This historic document has an ornate border around it with a vignette of an allegorical woman holding up a shield blocking lightning bolts. This item is hand signed by the company’s president and secretary and is over 86 years old. Lorelei is a large rock on the bank of the Rhine River near Sankt Goarshausen, Ger. The rock produces an echo and is associated with the legend of a beautiful maiden who threw herself into the Rhine in despair over a faithless lover and was transformed into a siren who lured fishermen to destruction. The essentials of the legend were claimed as his invention by German writer Clemens Brentano in his novel Godwi (1800-02). Lorelei has been the subject of a number of literary works and songs; the poem Die Loreley by Heinrich Heine was set to music by more than 25 composers.